This level has hard difficulty. For this level try to play from where more candies are available to play and make special candy. 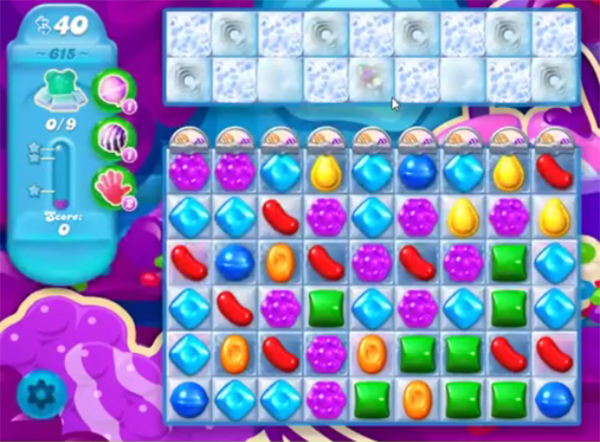 Try to make striped candy or fish and combine with colorbomb to break the blockers that are in top part of the board. Play near to snow blockers or use more special candy to break the snow blockers to find all bears within 40 moves. Another impossible level without insane luck. Just look at the videos. Why create these levels that are basically “flip a coin until you get tails 50 times in a row”? I agree. This level is total lottery. Since you can’t control where the fishes go, it’s entirely up to the game whether it decides to let you through this level or not. Every time I get to one of these lottery levels, I feel no satisfaction at completing it, because there is simply no skill at all involved. This is undoubtedly the worst yet. And it’s not “challenging,” any more than buying a lottery ticket is “challenging”. I’m done with this level. The fun has gone out of the game and I see no point in continuing. I am so sick of this level! I even bought hammers and bombs that it won’t let me use!!! Money wasted for nothing!! !